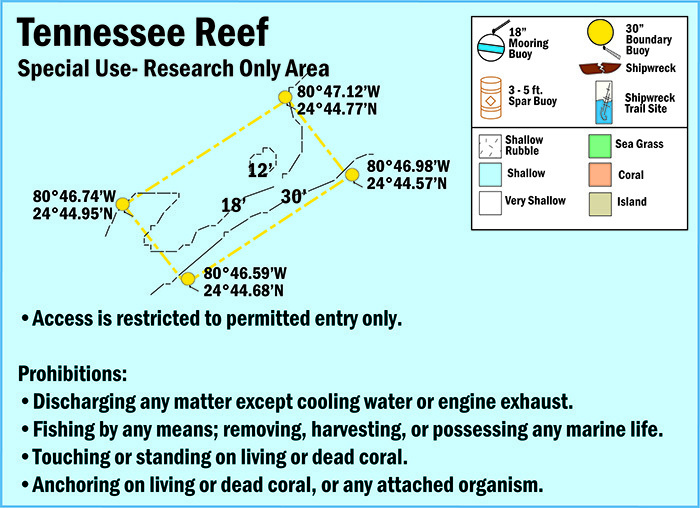 Tennessee Reef Research Only Area, located about four nautical miles south of Long Key, is closed to entry and identified by yellow buoys clearly marked with "Research Only." Tennessee Reef is a coral reef habitat containing a deep spur-and-groove system. It contains unique deepwater, slow-growth corals and sponges. By limiting this and other sites to research only, scientists will be able to differentiate impacts caused by use and those caused by changing environmental conditions. Special regulations apply here. Learn more about what activities are allowed in this type of zone.